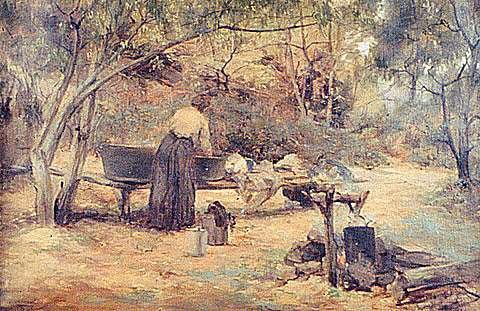 This is one of a number of plein-air paintings that Clara Southern produced where a woman is depicted at work within a domesticated bush landscape. Another of these paintings is ‘An Old Bee Farm, c. 1900’, and in both cases the model is painted in a similar pose, and in a range of colours which complement her surroundings and help her blend in as a natural part of the environment. When Clara Southern first moved to Warrandyte, the country washhouse was a common sight, with the hot water boiled in a large billy over an open fire, and copper tubs used for washing the clothes.